The French have a general with 5 pips in Fire, and ~16k more cannons than you. That's a heck of a lot of damage from those cannons. 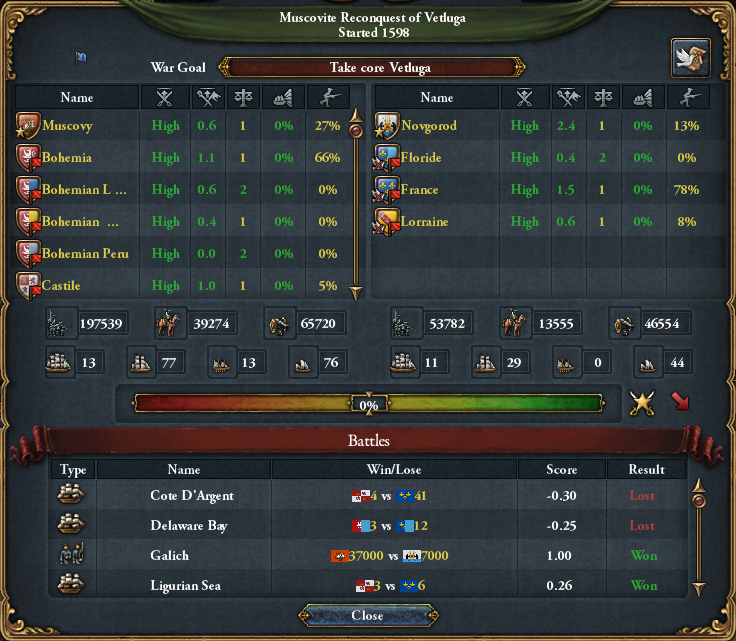 Add on to this the fact that they have 1.5 better army morale than you, and a slight advantage in cavalry numbers, and you can start to see why the balance is in their favour. Their whole back line is cannon, whereas yours is interspersed with infantry. This is a telling factor. 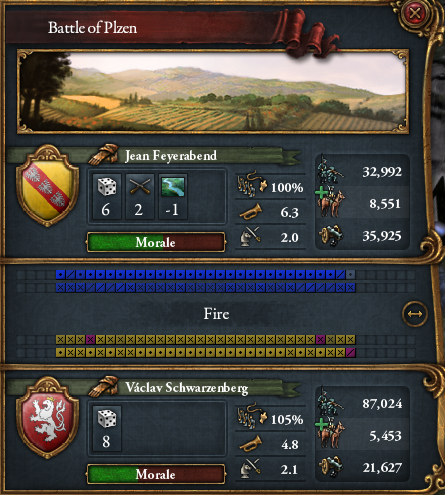 You need a better balance of cannon to infantry if you are going to match up against an army like the one France has here. You want to aim for the same situation as them where you can fill out the whole back line with cannon. As you can see, neither of the sides took very big losses to their cannon (France didn't lose any in fact! ), but your infantry got torn to shreds. That right there is the French firepower at work, sat behind soldiers with superior morale so that they are nigh-on invincible against your lower firepower and less elite troops. Patrick gave the perfectly right answer why you're losing. You additionally asked what you should do about it. Assuming you want to win (instead of just losing quickly), you should drag out the war, make it longer. If possible, siege them to gain warscore. If they siege you, let them, then siege the province back. 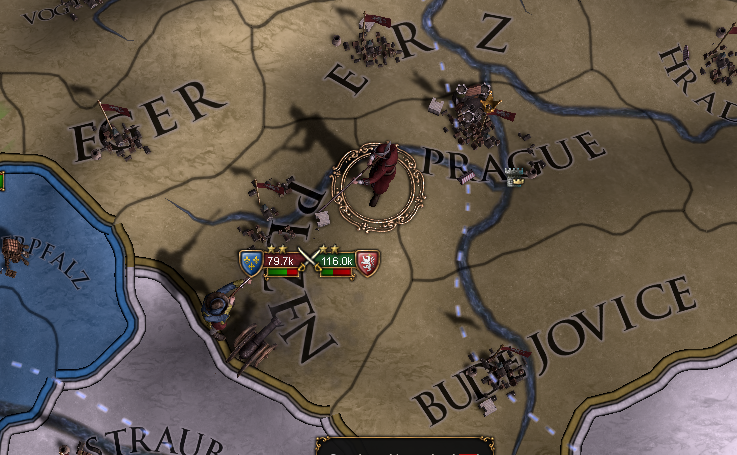 If they keep their army in one stack (which you cannot defeat), they will be slow to siege your country. So just siege it back when they move to another province. If they split their army up to siege you more quickly, wait for the right moment and kill one of their units before the big stack arrives back. If they make no mistake and don't give you an opportunity to pick up small parts of their force (without entering the big battle), they should win the war - that's to be expected, given that they are stronger, of course. But if they do make a mistake, you can win. On a big scale, keep in mind the strategy of mutual damage. Basically, when they siege your land, you might also just let them and instead siege theirs. If you siege faster, then you're eventually winning the war. Avoid big battles, just be everywhere, be annoying and don't ever let them get the decisive battle between your stacks. Of course, this will become an expensive war, because it will take a long time. Why france intervened to help me in independece war against Castile?